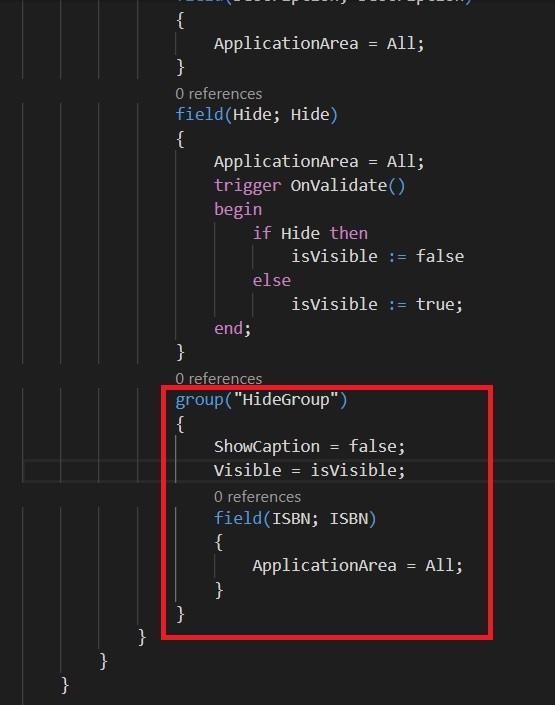 Showing and hiding fields on pages based on conditions seems to be a very easy task for a classic NAV developer, but with Dynamics 365 Business Central and the AL extensions I see very very often that this is a source of hours spent on calling all the saints in paradise. In order to avoid disturbing the saints, I’ll try to describe how to do that in Dynamics 365 Business Central with a simple example. I’ve created a small extension that adds a Book table, a Book List page and a Book Card page. A Book record has an “Hide ISBN” field that, when set to true, it must hide the ISBN field. This field must be visible if the “Hide ISBN” field is false. Then I’ve defined the two pages (Book Card and Book List). Here, the Visible property of the ISBN field is bounded to the isVisible global Boolean variable defined in the Book Card page (and setted as true in the OnOpenPage trigger). In the OnValidate trigger of the Hide field I set the isVisible value accordingly with the Hide field value (P.S. this is a quick sample so I’ve written the code directly in the page, but in the real world it’s much better to use events and avoid writing code on pages). What happens when I deploy the extension to Dynamics 365 Business Central? Result: the ISBN field is not displayed, despite the value of the Hide field! What’s the trick to have the correct show/hide behaviour? Use a group! If I deploy the extension again to Dynamics 365 Business Central, what happens now? and this is exactly the desired result. Next Microsoft Dynamics NAV and Dynamics 365 Business Central on-premise: why don’t you resize your Azure VMs? I guess I didnt explain right. I had the same problem as you. My field visiblity is controled by a value from the header record. So in BC is always hidden. But I cant put my field inside of a group since its on a list.